Bill Sandison, Wayne Northcott, Linda Stevenson, Rose Gibson, Joan Rymal, Ald. Dave Warden and Ald. Lori Baldwin-Sands accepted our invitation to visit municipal facilities, including city hall, the police station, Emslie Field, Pinafore Park, the Timken Centre and St. Thomas-Elgin Ontario Works to discover first-hand the obstacles faced by residents wishing to enjoy events at those venues or undertake business with staff. One of the most frustrating obstructions was the second-floor women’s washroom, adjacent to the mayor’s office. As Stevenson discovered, it was virtually impossible to undertake a 90-degree turn into the clearly-marked accessible facility. A new stop this time around was the wonderfully quaint confines of Emslie Field at Pinafore Park. Trouble is, if you have any mobility issues whatsoever, the grandstand is off limits and a trip to the washroom requires plenty of advance planning as Sandison discovered. 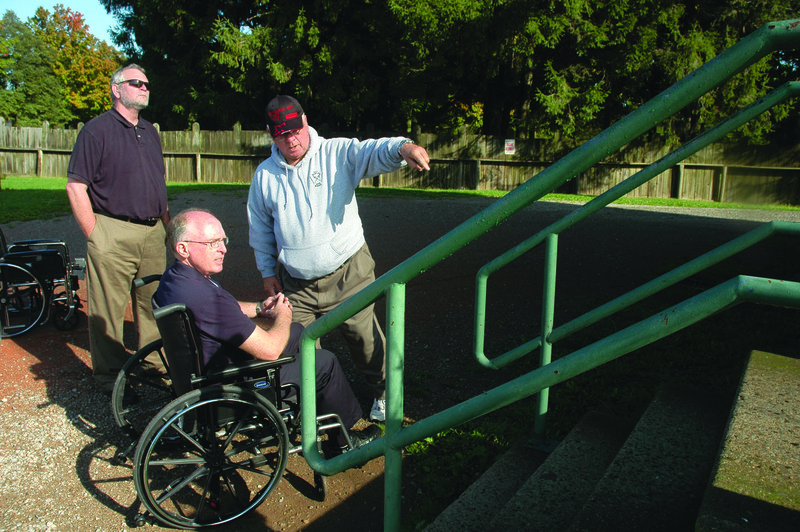 As Bill Sandison discovered, if you're in a wheelchair, the stands at Emslie Field are inaccessible. “We issue a municipal accessibility plan every year,” he noted. “I looked at it and it looks so much like the one from last year. I didn’t find Emslie Field on there and it’s been an issue for 10 years, why isn’t it on there? Linda Stevenson in wheel chair and Ald. Lori Baldwin-Sands with vision-impairing glasess had a difficult time attempting to conduct business at the Ontario Works office. Stevenson has had prior experience at the Timken Centre, and not always positive in nature. 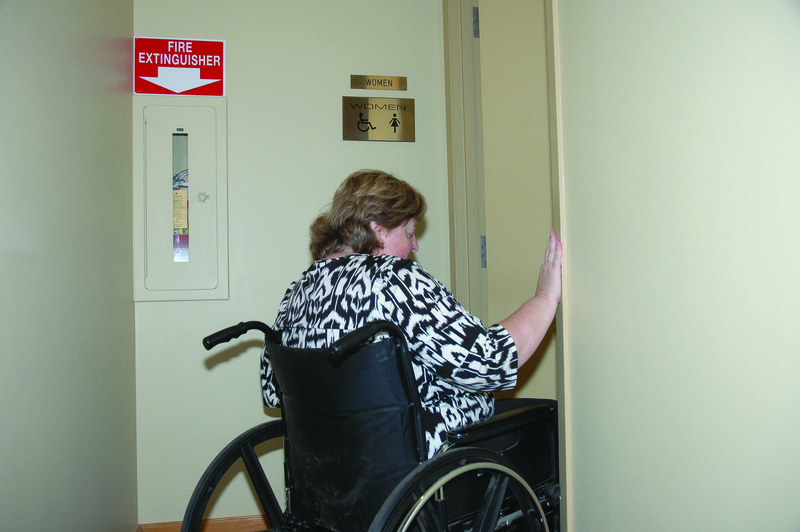 “When I go in to a brand new building like the arena, sometimes the doors are locked for the wheelchair accessible. How does that make sense? A staff member told us they were trying to save power. That makes that building unaccessible. It’s a brand new building. 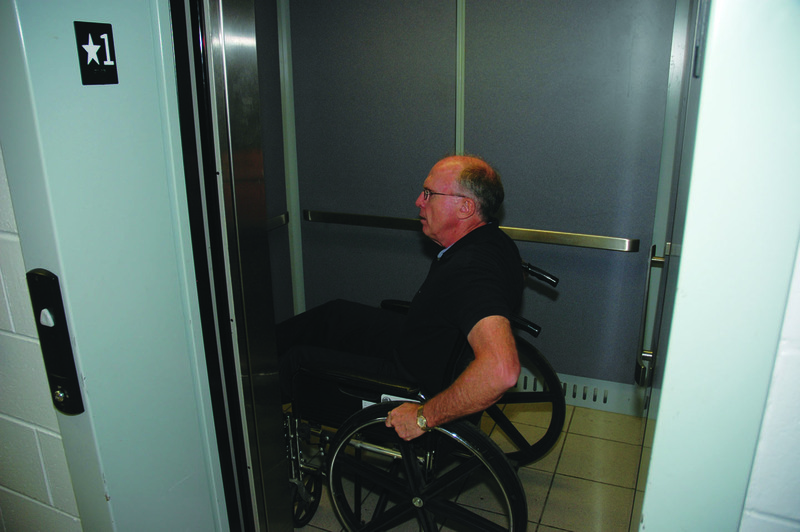 Bill Sandison in the very cramped elevator at the Timken Centre. On a plus side, St. Thomas Public Library has come a long way in the four years since Warden struggled up the ramp and into the facility on our first challenge. With the prospect of a new police headquarters in the coming years, Stevenson stressed the need to involve the city’s accessibility committee at the front end of planning. “As I understand it, the accessibility committee does get to make recommendations to council, but they don’t get to necessarily speak directly to council. I think when this presentation comes forward, they should have some absolute input into what that new police station looks like. City Scope appears Saturday in the Times-Journal. Questions and comments may be e-mailed to: mccallum@stthomastimesjournal.com. This entry was posted in 2010 Municipal election, accessibility, City of St. Thomas, City Scope and tagged Accessibility issues, City of St. Thomas, City Scope, Ed McLachlan, Emslie Field, St. Thomas Police Service, St. Thomas Public Library, Timken Centre. Bookmark the permalink. Thanks to Ed McLachlan for his time and committment to ensuring we all understand what happens when you have a different ability to see, hear, walk, and get around St. Thomas. The afternoon I spent with him was a great “eye-opener” to understand what STILL need to be done in this great city. As our population continues to age at a very fast rate, it will be very clear that we may not be able to keep up with work to be done to make this community fully accessable. When the city waste money on buildings like the Timkin centre by not getting it right the first time and going back time and time again to repair work that should have made the building accessable the first time round, we can only hope the new council will pay closer attention to the details. The folks who can’t access this building in its current state deserve better!!! with every rebuild, renovation and new build this city undertakes in the future. Pay close attention new council members….there must be wise investments with the few dollars you have to spend! !